Astronomers comparing data from an ongoing major survey of the sky using the National Science Foundation's Karl G. Jansky Very Large Array (VLA) to data from earlier surveys likely have made the first discovery of the afterglow of a powerful gamma ray burst that produced no gamma rays detectable at Earth. 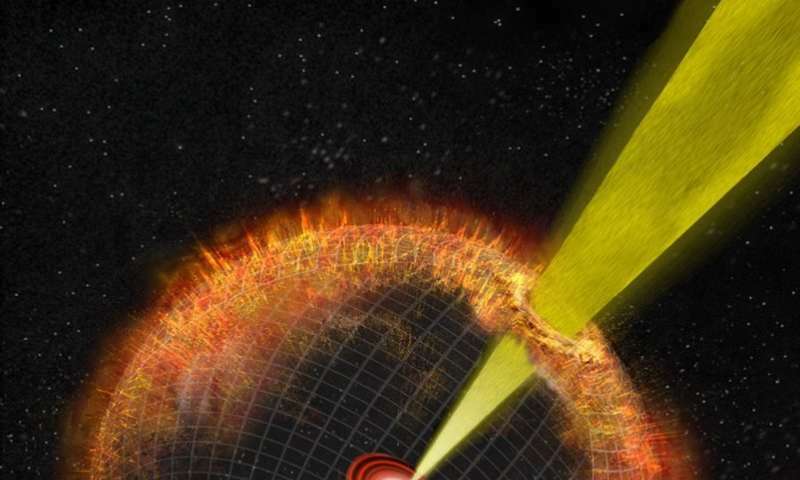 The unprecedented discovery of this "orphan" gamma ray burst (GRB) offers key clues to understanding the aftermath of these highly energetic events. "GRBs emit their gamma rays in narrowly focused beams. In this case, we believe the beams were pointed away from Earth, so gamma ray telescopes did not see this event. What we found is the radio emission from the explosion's aftermath, acting over time much as we expect for a GRB," said Casey Law, of the University of California, Berkeley. While searching through data from the first epoch of observing for the VLA Sky Survey (VLASS) in late 2017, the astronomers noted that an object that appeared in images from an earlier VLA survey in 1994 did not appear in the VLASS images. They then searched for additional data from the VLA and other radio telescopes. 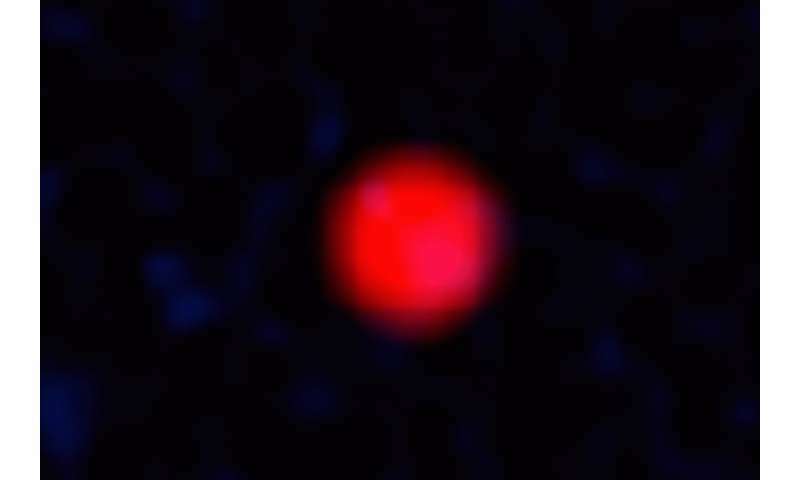 They found that observations of the object's location in the sky dating back as far as 1975 had not detected it until it first appeared in a VLA image from 1993. "This is a small galaxy with active star formation, similar to others in which we have seen the type of GRBs that result when a very massive star explodes," Law said. However, after searching databases from gamma ray observatories, "We could find no convincing candidate for a detected GRB from this galaxy," Law said. While there are other possible explanations for the object's behavior, the scientists said that a GRB is the most likely. "This is exciting, and not just because it probably is the first 'orphan' GRB to be discovered. It also is the oldest well-localized GRB, and the long time period during which it has been observed means it can give us valuable new information about GRB afterglows," Law said. "Until now, we've never seen how the afterglows of GRBs behave at such late times," noted Brian Metzger of Columbia University, co-author of the study. "If a neutron star is responsible for powering the GRB and is still active, this might give us an unprecedented opportunity to view this activity as the expanding ejecta from the supernova explosion finally becomes transparent." "I'm delighted to see this discovery, which I expect will be the first of many to come from the unique investment the National Radio Astronomy Observatory (NRAO) and the National Science Foundation are making in VLASS," said NRAO Director Tony Beasley.